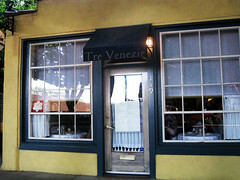 We went to the one Michelin star Northern Italian restaurant Trattoria Tre Venezie for our father’s birthday. It’s located in a cozy small house on Green Street in Old town Pasadena just a block from the insanely crowded and gaudy Buca di beppo. The interior was intimate and looked like someone’s house. 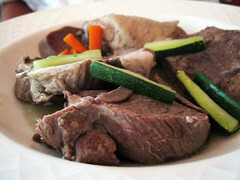 Though the opinions on the food seems to be divided among critics and netizens. The press reviews were uniformly glowing (“authentic” “very regional”) while quite a number of chowhounders / bloggers / yelpers found it disappointing and overpriced. The menu sounded very interesting to us so we decided to give it a try. 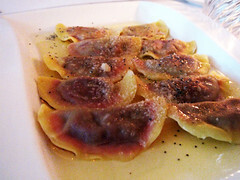 However it was very disappointing that the two dishes I like to try most weren’t available on the night we were there. One is cjalsons, an ancient and traditional pasta known only in a little area in Friuli called Carnia and the other is Bolito Fish. 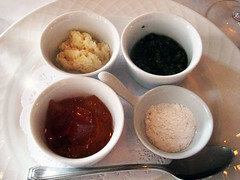 You can see pictures of both dishes on my friend’s blog entry. 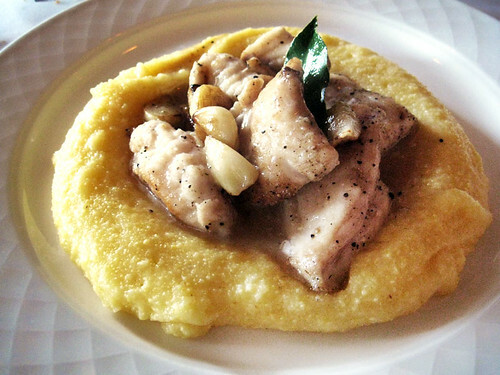 Boreto Alla Gradese – Sauteed fish with roasted Garli, black pepper and soft polenta. It’s a traditional fish dish of Laguna di Grado. It was good but I wasn’t blown away by it. 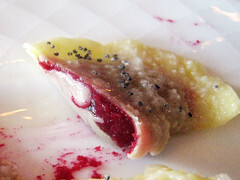 Casunziei all’ampezzana – Ravioli filled with red beets and seasoned with brown butter, Parmigiano Reggiano and poppy seeds. An interesting tasting dish. I like the subtle sweetness from the beets. It smells great too. Bollito Misto: a North Italy dish: traditional dish of boiled mixed meat, comes with green sauce, house-made mostarda di frutta (Fruit Mustard, it was Peach), salsa al rafano (Horseradish) and Himalayan pink salt. This dish strongly reminded me of something I had at Vienna, perhaps it’s from the northern part of Italy which had strong influences from Austria. Out of the meat I like the tongue the most, wish there were more pieces of it. The lamb were a bit overcooked. The horseradish and fruit mustard made the meat tasted very Austrian/German. It’s hearty but overall I think it’s just an okay dish. 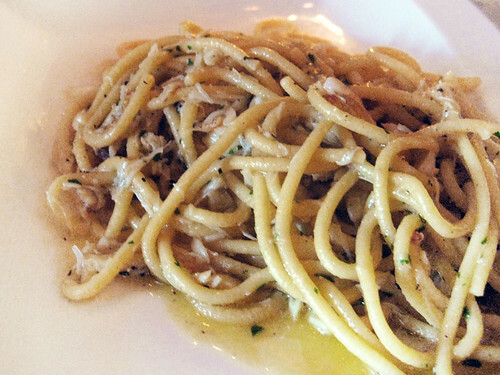 A special of the night, spaghetti with crab. It was the favorite of the night. Very flavorful. The crab meat were fresh and tasty. In the end we weren’t disappointed though we weren’t really blown away by them either. We did enjoy the food though, but they were a bit on the pricey side. Next time I would love to try the cjalsons and Bolito Fish, and I think it’s better to get more simple pasta dishes like spaghetti with crab. I wanted to like this place so much but was utterly disappointed. Everything was so-so, but the cheese plate was literally a joke. They put about 1/2 ounce of three kinds of cheese on big plate and charged over $18. 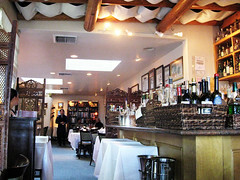 I wish it was better, as there are certainly few great Italian options in Pasadena (although I did recently try Siena on Union and really loved it!). Going to a new restaurant that I’ve never tried for special occasions always gets me really worried…what if the food turns out bad? ^^;;; Glad that this place turned out alright. Your dad is truly adventurous! My dad will never agree to go to any non-chinese restaurants for his birthday! Tokyoastrogirl, I too was a bit disappointed as my expectation were high: the menu sound authentic and exotic, but alas most of the meat dish looks more interesting on paper than it actually taste. Thank you for the suggestion, I’ll try Siena next. Was going to check this place out this weekend, but ended up at Bistro 45 instead. About the lamb dish, however, I don’t suppose they ask how you like it cooked? Good article=D i will definitely visit again. We're twin sisters who've been blogging about eating out in Los Angeles (and beyond) since 2004! potatomato.blog « © 2019 All Rights Reserved.